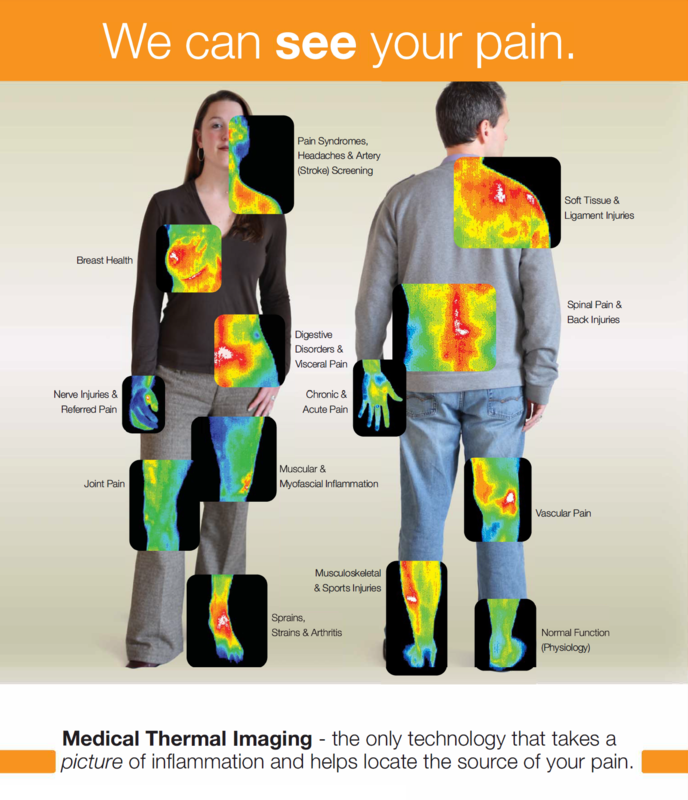 The only method that can assess, visualize, and record indications of pain & pathology in any area of the body. This quick and easy test starts with your medical history being taken before you partially disrobe for the scanning to be performed. Standard region of interest exams take approximately 15 minutes and a full body 30 minutes. The digitized images are sent electronically to a Thermologist (certified medical doctor) for interpretation and reporting. Your printed or digital report is normally completed within a few days and can be sent to you and your healthcare professional. Football player with a stress fracture that was not detected with x-ray. Bone scan confirmed the thermographic findings. Pain in the jaw. 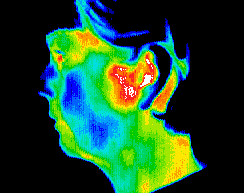 Thermogram findings help confirm diagnosis of TMJ and referral to the appropriate specialist for treatment. Arthritic disorders general appear as 'hot areas', since the affected sites are usually inflamed. Upper back and neck pain, also regular head aches. 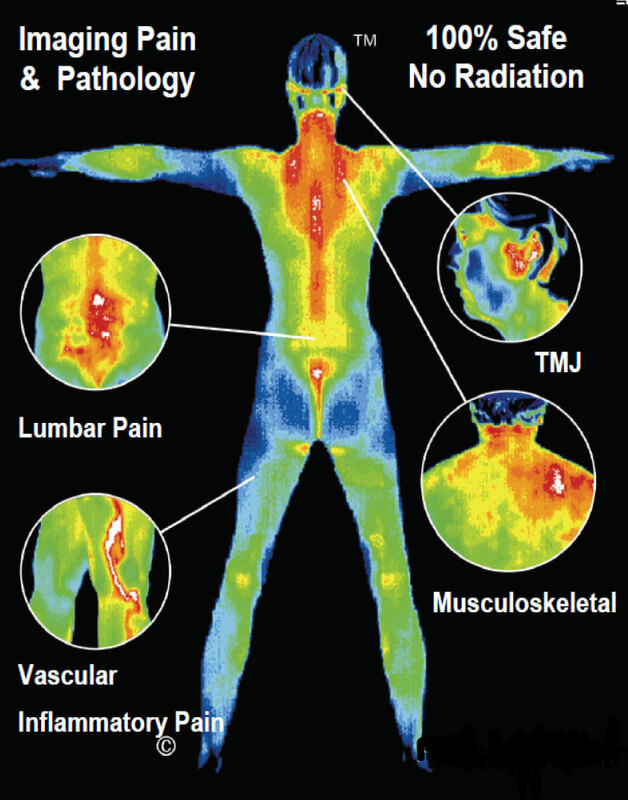 Thermography guided treatments achieved better results than any previously. Significant inflammatory changes in the right breast. Referral to a breast specialist and a subsequent biopsy diagnosed inflammatory breast cancer at a very early stage. A painful ankle injury can monitored throughout treatment and rehabilitation. Good thermal symmetry with no suspicious thermal findings. These patterns represent a baseline that won’t alter over time and can only be changed by pathology. There were no visible signs of abnormality. Referral to a breast specialist and a subsequent biopsy diagnosed inflammatory breast cancer at a very early stage. The vascular asymmetry in the upper left breast was particularly suspicious and clinical investigation indicated a palpable mass. A biopsy was performed and a DCIS of 2 cm was diagnosed. Significant vascular activity in the left breast which was clinically correlated with fibrocystic changes. Increase your chances of detecting breast cancer in its earliest stages. Thermography's role in breast health is to help in Early detection and monitoring of abnormal physiology and the establishment of risk factors for the development or existance of pathology, whether benign or malignant. When used with other procedures the best possible evaluation of breast health is made. In your first thermal study, we take a baseline image of the breast for an infrared map. This infrared map will be completely unique to you, kind of like a "thermal signature" or a "digital breast thumbprint". Three months later, we will repeat the same process with another image to set the baseline for a reliable annual comparison. 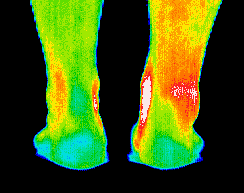 All of your thermographic images are recorded and once that stable thermal baseline has been established, any changes will be detected during your routine annual studies.